Now that the weather is getting cooler and the fall is unmistakably moving in, it's time to get back into some good hearty soup recipes. 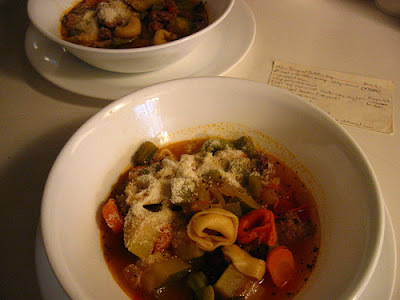 Today I'm going to share a personal favorite from our heavy rotation: Italian Sausage and Tortellini Soup. This soup can be made from beginning to end in about an hour, and it will easily feed six or more. Remove casings from the sausages, then fry in a large pot with a little oil until cooked through, breaking up the sausages with a spatula as you fry them. 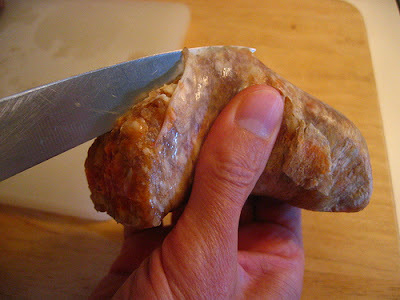 Transfer sausage to a separate bowl and pour off most of the sausage fat left in the pot (leave ~1 Tbsp of fat or so). Saute onion and garlic on medium heat in the remaining sausage oil for ~5 minutes. 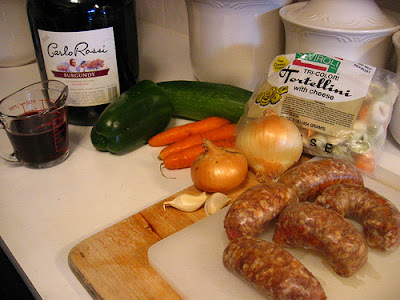 Then, add back the sausage, and add all of the remaining ingredients except the tortellini and Parmesan cheese (water, bouillion cubes, tomatoes, tomato sauce, zucchini, carrots, green pepper, red wine, basil and oregano). Bring to a boil, reduce heat, and simmer for ~40 minutes, until vegetables are tender. Then add tortellini to the soup and simmer for another 8 minutes. 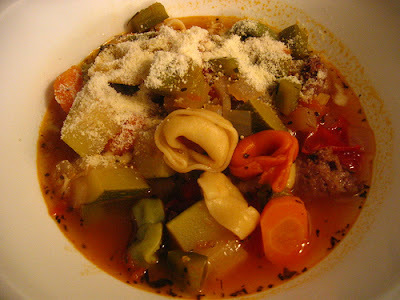 Serve in soup bowls, sprinkled generously with parmesan cheese. 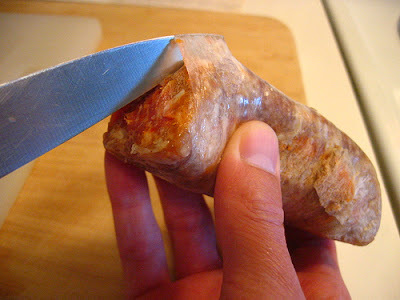 1) A quick tutorial on removing casing of sausages (with apologies to vegetarian readers!). 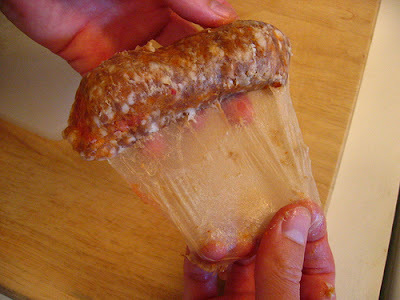 It's easiest to do this when the sausages are mostly thawed. And be prepared to get slightly messy hands. At this point you'll see how the casing will peel off relatively easily. 2) For some reason, the team here at Casual Kitchen has a consistent problem of forgetting the cheese tortellini. Either we forget to put tortellini on the grocery list so we leave the store without them, or we flake and forget to add them to the dish at the end. It's a non-catastrophic, yet still annoying, error that we've made enough times such that Laura wrote "don't forget!" on the ingredient list next to the tortellini. I thought I'd share this to let readers know that here at Casual Kitchen we flake out and forget things too. 3) You know my view on excess salt. In its original form, this dish called for five cups of water and five (five!) bouillion cubes. That's cheating. We've cut it down to three cubes in six cups of water and have found the dish tastes great this way, but you are welcome to try and take the cube count down further still if you like. Let me know how it comes out. 4) Finally, if you're interested in a more detailed photoset of the entire recipe making process, I've made it available on flickr for you. Enjoy! Sounds and looks delicious, but where's the extra virgin olive oil? And that wouldn't be shake on "Parm" (shudder) would it? I'm definitely a big fan of extra virgin olive oil. But for a dish like this, when it's just a replacement base for sauteing onions and garlic or frying up sausage, it's kind of a waste of the good stuff. Hey, long time listener, first time caller. Take out the veggies, and replace the broth with alfredo sauce, and you've got yourself a dinner guest! Alfredo sauce! That's a sauce I never really mastered to be honest. Maybe one to try for the benefit of the blog at some point. Thanks for reading and for your comment.